The Guide program's aim is to collect and exchange gently used musical instruments to institutions, which financially cannot afford to purchase them. Beginning fall 2014 in collaboration with Miles College Division of Humanities Bachelor of Music Education Program called P-12 Band–In-A-Box instrumental project, the Foundation’s GUIDE program will be a key supplier of the needed instruments for P-12 Band-In-A-Box project. We are extremely saddened by the sudden passing of Dr. Bobby Fong on September 8, 2014. He was wholeheartedly generous, kind and sincerely devoted to educating our children. The Jimmy McDaniels Foundation appreciated his enthusiastic support. Make sure to visit and like the Jimmy McDaniels Facebook page and listen to some of his classic songs on YouTube!! 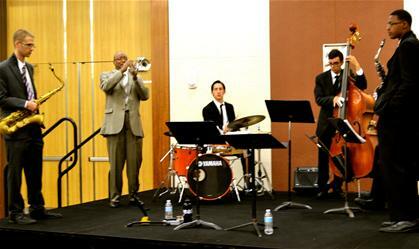 In honoring our mission Saving Music in Higher Education, in April 2015 and October 2015 The Jimmy McDaniels Foundation will present their scholarship recipients at their Annual Jazz Brunches in Birmingham, Alabama and Indianapolis, Indiana for music students attending Miles College and Butler University.